This Cannabinoid Profile will take a different approach from previous posts. Instead of profiling a specific cannabinoid I am going to profile the CB1 and CB2 receptors, which are the main receptor sites for the body’s endocannabinoid system and interact with all currently identified cannabinoids in some way. A scientific understanding of these receptor points and how the 70+ cannabinoids interact with them and with eachother is crucial to the future of using cannabis as a medicine, for us as a society and as individuals. Thus far the CB1 and CB2 receptors are the only receptor sites that have been identified that make up the endocannabinoid system. It is suspected that another site exists in the brain, possibly at the TrpV1 receptor or the 5HT1a receptor. Both CB1 and CB2 receptors are coupled to G-proteins; CB1 receptors are present in the central nervous system, both types of receptors are also located throughout the body at certain key points (immune, reproductive). Here is the general layout for CB1 and CB2 receptors in the body. 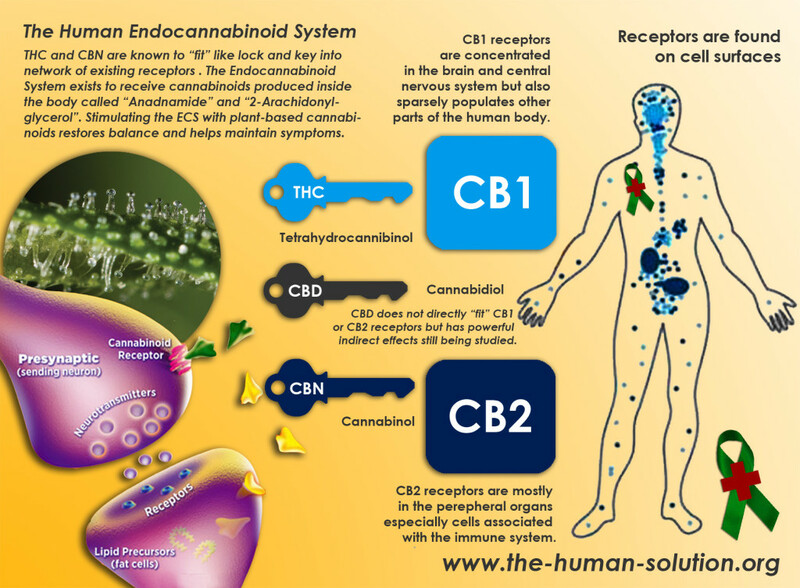 While I like this image for the map it provides of CB1/CB2 sites they mis-spell the endocannabinoid anandamide, which is kind of like the body’s natural THC. Anandamide is one of six endogenous cannabinoid receptor agonists that have been identified. An “endogenous cannabinoid receptor agonist” is a cannabinoid made inside your body that triggers a reaction at a particular point. These endocannabinoids are the chemicals that phytocannbinoids, plant-based cannabinoids, emulate within our bodies to produce their effects. Many of the effects of these various endo and phyto cannabinoids are on our brain. There are numerous locations throughout the brain where CB1 receptors have been found as well as activity at the TrpV1 receptor and 5HT1a receptors. See that brain? Look at all those CB1 receptors! This receptors control everything from basics like movement and pain perception all the way up to our higher cognitive functions and learning. I guess that explains why cannabinoids have been found in breast milk in multiple studies. It is enough to make you wonder if cannabinoids are requiredfor healthy human functioning. That isn’t saying everyone must use cannabis to be healthy, but it is saying that everyone needs a functioning endocannabinoid system to be healthy and in absence of one supplement with phytocannabinoids. That’s the down and dirty on CB1 and CB2 receptors, as with all these posts when I learn more you will learn more and I will update this post. Reblogged this on Legalize Cannabis.